It was 4:45 a.m. on a Saturday when I started to write this Runnerchica article. Pretty much every normal person I knew was still sleeping. Yet, there I was, eating bites of waffles between keystrokes, preparing for a 20 mile run. As I got myself out of bed that morning, I believe my first thought was, “Why do I do this?” I mean, I love running, but it was really early, and it had been a long week. I wanted to sleep just as much as the next person. But I was up. I was up, and I was excited to run. Of course not excited in an “it’s Christmas morning” sense, but excited because I knew a few things. First, I knew that I had two running pals waiting for me, who would make the run not only bearable, but also fun and memorable. 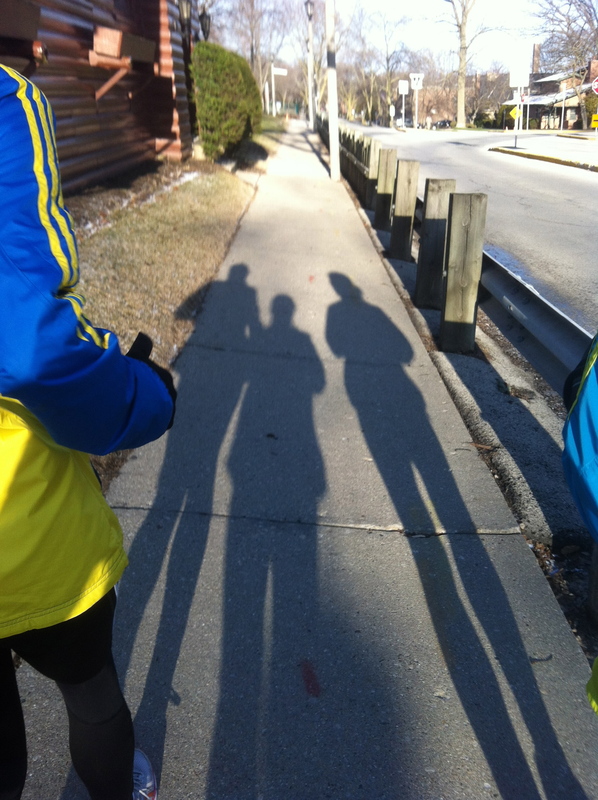 Second, that day was my final long run before the Boston Marathon. Anything done in preparation for this event supersedes feelings of “I don’t want to do this.” Getting back to Boston has been my focus for the last year. Finally, I’m okay with being up at this early hour because I know a secret. It’s the secret that may finally explain to non-runners just what the appeal is to running for hours on end. That secret, quite simply, is that running motivates people to do extraordinary things. Crazy things too, like getting up at 4:45 on a Saturday, but that’s a good example of the power of running. If one is disciplined enough to get up to train on a Saturday, in a blizzard, or after a hard day’s work (when the couch sounds oh so much more appealing), one is a lot more likely to accomplish other goals- both big and small. It’s this kind of discipline that gives runners the feeling they can (and will) do anything their heart desires. Maybe there’s something in the Gatorade we’re all drinking, but yes, running tends to do something to runners. I love running, because running has a ripple effect- you train, you feel good. Feeling good, you feel as if you could conquer the world, or at the very least, your “to do” list. Consequently, you get more done, and look for ways to do more. Then, since you’re feeling so good, with all of those endorphins swirling about, many times you look for ways to make the world a better place. This happened to a man named John Stoller, a Boston runner who found a way to make a difference through his running. John caught the marathon bug in 2007, when a friend asked him to meet at mile 10 of the Boston Marathon and keep him company for a few miles. Well, mile 10 led to 15, and soon John got caught up in the fact that he was running in a race he’d watched all his life. He was hooked. At mile 18 he told his family, “I think I can finish!” He continued on, with the last two turns of the race being the most moving. As he turned right onto Hereford Street, he says he felt absolutely incredible, picking up on the energy of the crowd and history of the event. Then, he turned left on Boylston Street, and knew that he would be back to run the whole thing in 2008. Well, in 2008, he not only ran the marathon, but ran it for the American Liver Foundation. 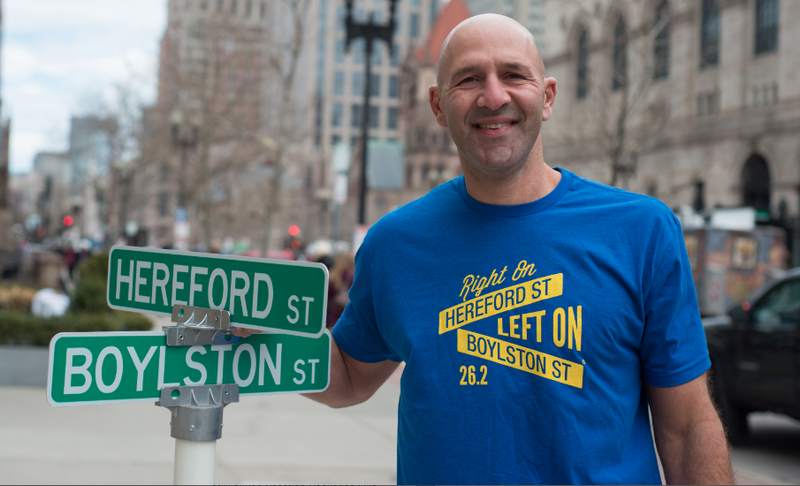 During one of his training runs, he came up with an idea to put the slogan, “Right on Hereford St, Left on Boylston St” on t-shirts and then sell them to earn even more money for his cause. He wanted to capture the spirit of the motivation runners possess to get to those last two historic turns. This spirit caught on, and his t-shirt grew into a t-shirt company, Right on Hereford, Left on Boylston, that now benefits approximately 25 charities. The gear sold boasts the “Right on Hereford, Left on Boylston” slogan as well as other running related mottos. 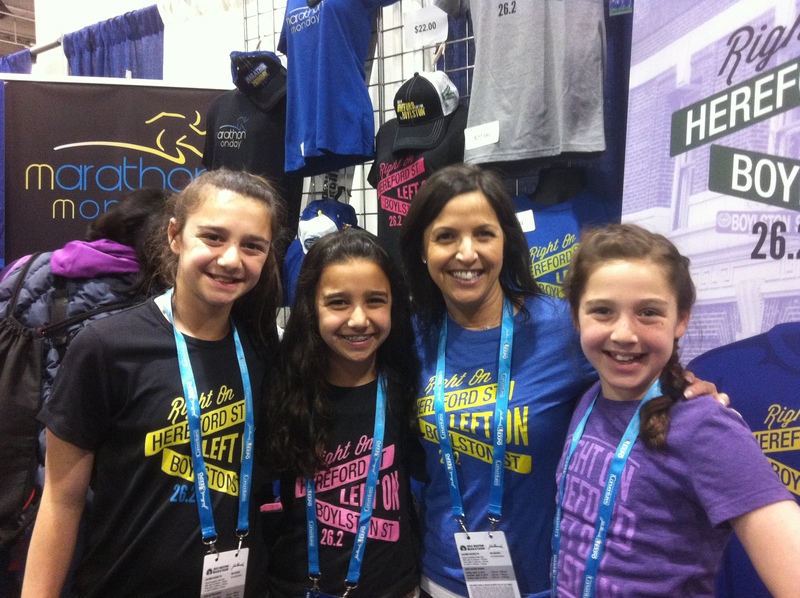 I met John at his booth at the Boston Marathon Expo last year, a day before the run. His wife and three daughters were there too, helping sell t-shirts, and the good energy of this family working together at the busy expo was the reason both my friend and I decided to stop. While paying for the shirts, we learned the story behind the slogan. This made me even more excited to finish the marathon, feeling a bit nostalgic about those two last turns. The next day, when we finally reached Hereford, I felt that same magic John talked about. I was caught up in the crowds, the energy, and the smiling faces and enthusiasm of all the people I passed as I turned onto Boylston. Their excitement moved me to tears. Little did I know what was about to happen just minutes after I passed those people. A few weeks later, I wore my t-shirt back home in Milwaukee. Several people asked what it was all about, and I told them the story. Inevitably, our discussion went to the tragedies, and we wondered what the company would do at the 2014 Marathon. Visit rightonlefton.com to purchase your t-shirt today! Getting back to the extraordinary, let’s talk about resiliency of the human spirit. You’ll find it in Boston- in all of those injured, their families, the spectators, the citizens, the law enforcement officials, others who were there to help, and of course, everyone who ran on that day. It’ll be there this April 21 as well, shining strong in every runner, fan, and supporter showing that indeed, when people get together for a run, it is nothing short of extraordinary. Be strong, friends, and never stop trying to be extraordinary. and all of the extraordinary individuals who came to their assistance. Thanks for the comment! It was great! 🙂 Thanks for the nomination… I’ll check it out!